Did you see these men steal in North Yorkshire? The other man captured on CCTV. Police have released CCTV images of two men they are trying to trace in connection with theft from a Knaresborough supermarket. The incident happened on November 17 but North Yorkshire Police has only just released details. 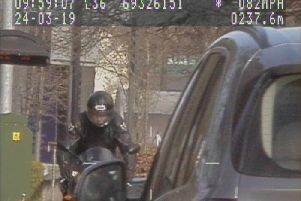 One of the men police want to trace. At 4pm a man entered the Co-op in the town before leaving without buying anything and stood outside the store entrance. A second man walked immediately and put a packet of meat in his jacket pocket and left without paying. The first man then reached into the doorway and grabbed a tub of Quality Streets and ran off with the other man. Alternatively, Crimestoppers can be contacted anonymously on 0800 555 111. Quote reference number 12170206886.